Hepatocellular carcinoma in an individual who was hepatitis C positive. Autopsy specimen. Hepatocellular carcinoma (HCC), also called malignant hepatoma, is the most common type of liver cancer. Most cases of HCC are as a result of either a viral hepatitis infection (hepatitis B or C), metabolic toxins such as alcohol or aflatoxin, conditions like hemochromatosis and alpha 1-antitrypsin deficiency or NASH. Treatment options for HCC and prognosis are dependent on many factors but especially on tumour size, staging, and extent of liver injury. Tumour grade is also important; high-grade tumors will have a poor prognosis, while low-grade tumors may go unnoticed for many years, as is the case in many other organs. HCC is relatively uncommon in the United States and many other developed countries. It occurs most commonly in countries where hepatitis B infections are common. Most cases of hepatocellular carcinoma occur in people who already have symptoms of chronic liver disease and present either with worsening of symptoms or during surveillance that is used to screen patients who are at risk the most. In other cases, HCC may directly present with yellow skin, bloating from fluid in the abdomen, easy bruising from blood clotting abnormalities, loss of appetite, unintentional weight loss, abdominal pain especially in the right upper quadrant, nausea, vomiting, or feeling tired. The most important risk factors vary widely from country to country. In countries where hepatitis B is endemic, such as China, hepatitis B is the predominant cause of Hepatocellular Carcinoma. Whereas in countries, such as the United States, where Hepatitis B is rare because of high vaccination rates, the major cause of HCC is Cirrhosis (often due to hepatitis C, obesity or alcohol abuse). The risk of hepatocellular carcinoma in type 2 diabetics is greater (from 2.5 to 7.1 times the non diabetic risk) depending on the duration of diabetes and treatment protocol. A suspected contributor to this increased risk is circulating insulin concentration such that diabetics with poor insulin control or on treatments that elevate their insulin output (both states that contribute to a higher circulating insulin concentration) show far greater risk of hepatocellular carcinoma than diabetics on treatments that reduce circulating insulin concentration. On this note, some diabetics who engage in tight insulin control (by keeping it from being elevated) show risk levels low enough to be indistinguishable from the general population. This phenomenon is thus not isolated to diabetes mellitus type 2 since poor insulin regulation is also found in other conditions such as metabolic syndrome (specifically, when evidence of non alcoholic fatty liver disease or NAFLD is present) and again there is evidence of greater risk here too. While there are claims that anabolic steroid abusers are at greater risk (theorized to be due to insulin and IGF exacerbation), the only evidence that has been confirmed is that anabolic steroid users are more likely to have hepatocellular adenomas (a benign form of HCC) transform into the more dangerous hepatocellular carcinoma. When hepatocellular adenomas grow to a size of more than 6–8 cm, they are considered cancerous and thus become a risk of hepatocellular carcinoma. Although hepatocellular carcinoma most commonly affects adults, children who are affected with biliary atresia, infantile cholestasis, glycogen-storage diseases, and other cirrhotic diseases of the liver are predisposed to developing hepatocellular carcinoma. Children and adolescents are unlikely to have chronic liver disease, however, if they suffer from congenital liver disorders, this fact increases the chance of developing hepatocellular carcinoma. Young adults afflicted by the rare fibrolamellar variant of hepatocellular carcinoma may have none of the typical risk factors, i.e. cirrhosis and hepatitis. Hepatocellular carcinoma, like any other cancer, develops when there is a mutation to the cellular machinery that causes the cell to replicate at a higher rate and/or results in the cell avoiding apoptosis. In particular, chronic infections of hepatitis B and/or C can aid the development of hepatocellular carcinoma by repeatedly causing the body's own immune system to attack the liver cells, some of which are infected by the virus, others merely bystanders. While this constant cycle of damage followed by repair can lead to mistakes during repair which in turn lead to carcinogenesis, this hypothesis is more applicable, at present, to hepatitis C. Chronic hepatitis C causes HCC through the stage of cirrhosis. In chronic hepatitis B, however, the integration of the viral genome into infected cells can directly induce a non-cirrhotic liver to develop HCC. Alternatively, repeated consumption of large amounts of ethanol can have a similar effect. The toxin aflatoxin from certain Aspergillus species of fungus is a carcinogen and aids carcinogenesis of hepatocellular cancer by building up in the liver. The combined high prevalence of rates of aflatoxin and hepatitis B in settings like China and West Africa has led to relatively high rates of heptatocellular carcinoma in these regions. Other viral hepatitides such as hepatitis A have no potential to become a chronic infection and thus are not related to hepatocellular carcinoma. Hepatocellular carcinoma (HCC) most commonly appears in a person with chronic viral hepatitis (hepatitis B or hepatitis C, 20%) or/and with cirrhosis (about 80%). These people commonly undergo surveillance with ultrasound (US) due to the cost-effectiveness. Surveillance differs but the American Association of Liver Diseases recommends screening Asian men over the age of 40, Asian women over the age of 50, people with HBV and cirrhosis, and African and North American blacks. These people are screened with US every 6 months. AFP is a marker that is useful if it is markedly elevated. At levels less >20 sensitivity is 41-65% and specificity is 80-94%. However, at levels >200 sensitivity is 31, specificity is 99%. Ultrasound (US) is often the first imaging and screening modality used. On US, HCC often appears as a small hypo-echoic lesion with poorly defined margins and coarse irregular internal echoes. 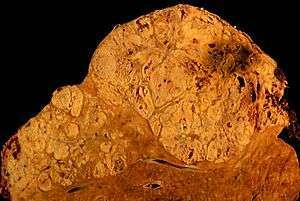 When the tumor grows, it can sometimes appear heterogeneous with fibrosis, fatty change, and calcifications. This heterogeneity can look similar to cirrhosis and the surrounding liver parenchyma. A systemic review found that the sensitivity was 60 percent (95% CI 44-76%) and specificity was 97 percent (95% CI 95-98%) compared with pathologic examination of an explanted or resected liver as the reference standard. The sensitivity increases to 79% with AFP correlation. In people with a higher suspicion of HCC (such as rising alpha-fetoprotein and des-gamma carboxyprothrombin levels), the best method of diagnosis involves a CT scan of the abdomen using intravenous contrast agent and three-phase scanning (before contrast administration, immediately after contrast administration, and again after a delay) to increase the ability of the radiologist to detect small or subtle tumors. It is important to optimize the parameters of the CT examination, because the underlying liver disease that most people with HCC have can make the findings more difficult to appreciate. Triple phase helical CT improves the detection of these tumors. Due to the increased vascularity of hepatocellular carcinoma, the classic finding on CT imaging is hypervascularity in the arterial phase with washout in the portal and delayed phases. A pseudocapsule, a mosaic pattern and both calcifications and intralesional fat may be appreciated. A systemic review found that the sensitivity was 68 percent (95% CI 55-80%) and specificity was 93 percent (95% CI 89-96%) compared with pathologic examination of an explanted or resected liver as the reference standard. With triple phase helical CT, the sensitivity 90% or higher, but this data has not been confirmed with autopsy studies. Classification of HCC on CT: Liver Image Reporting and Data System (LI-RADS): LI-RADs is the new way to standardize/classify the HCC lesions found on CT and MRI. Radiologists use this classification system in their imaging reports in order to further characterize suspicious lesions. As a general introduction, LR1 and LR2 get continued surveillance. LR3 has variable follow up. LR4 gets close follow up, additional imaging or treatment. LR5 gets treatment. A biopsy is not needed to confirm the diagnosis of HCC if certain imaging criteria are met. CT scans use contrast agents, which are typically iodine- or barium-based. Some patients are allergic to one or both of these contrast agents, most often iodine. Usually the allergic reaction is manageable and not life-threatening. An alternative to a CT imaging study would be Magnetic Resonance Imaging (MRI). MRI has about the same sensitivity for detecting HCC has helical CT. However, MRI has the advantage of delivering high resolution images of the liver without nephrotoxic contrast agents or ionizing radiation. HCC appears as a high intensity pattern on T2 weighted images and a low intensity pattern on T1 weighted images. The advantage of MRI is that is has improved sensitivity and specificity when compared to US and CT in cirrhotic patients in whom it can be difficult to differentiate HCC from regenerative nodules. A systematic review found that the sensitivity was 81 percent (95% CI 70-91%) and specificity was 85 percent (95% CI 77-93%) compared with pathologic examination of an explanted or resected liver as the reference standard. The sensitivity is further increased gadoxetic acid-enhanced and diffusion-weighted imaging are combined. Despite the advantages of MRI, helical CT remains the technique of choice among radiologists due to the high cost and long image acquisition time of MRI. In a review article of the screening, diagnosis and treatment of hepatocellular carcinoma, 4 articles were selected for comparing the accuracy of CT and MRI in diagnosing this malignancy. Radiographic diagnosis was verified against post-transplantation biopsy as the gold standard. With the exception of one instance of specificity, it was discovered that MRI was more sensitive and specific than CT in all four studies. Micrograph of hepatocellular carcinoma. Liver biopsy. Trichrome stain. Macroscopically, liver cancer appears as a nodular or infiltrative tumor. The nodular type may be solitary (large mass) or multiple (when developed as a complication of cirrhosis). Tumor nodules are round to oval, grey or green (if the tumor produces bile), well circumscribed but not encapsulated. The diffuse type is poorly circumscribed and infiltrates the portal veins, or the hepatic veins (rarely). Microscopically, there are four architectural and cytological types (patterns) of hepatocellular carcinoma: fibrolamellar, pseudoglandular (adenoid), pleomorphic (giant cell) and clear cell. In well differentiated forms, tumor cells resemble hepatocytes, form trabeculae, cords and nests, and may contain bile pigment in cytoplasm. In poorly differentiated forms, malignant epithelial cells are discohesive, pleomorphic, anaplastic, giant. The tumor has a scant stroma and central necrosis because of the poor vascularization. The prognosis of HCC is affected by the staging of the tumour as well as the livers function due to the effects of liver cirrhosis. There are a number of staging classifications for HCC available however due to the unique nature of the carcinoma in order to fully encompass all the features that affect the categorisation of the HCC, a classification system should incorporate; tumor size and number, presence of vascular invasion and extrahepatic spread, liver function (levels of serum bilirubin and albumin, presence of ascites and portal hypertension) and general health status of the patient (defined by the ECOG classification and the presence of symptoms). Out of all the staging classification systems available the Barcelona Clinic Liver Cancer (BCLC) staging classification encompasses all of the above characteristics. This staging classification can be used in order to select people for treatment. MRI is the best imaging method to detect the presence of a tumor capsule. Since hepatitis B or C is one of the main causes of hepatocellular carcinoma, prevention of this infection is key to then prevent hepatocellular carcinoma. Thus, childhood vaccination against hepatitis B may reduce the risk of liver cancer in the future. In the case of patients with cirrhosis, alcohol consumption is to be avoided. Also, screening for hemochromatosis may be beneficial for some patients. It is unclear if screening those with chronic liver disease for hepatocellular carcinoma improves outcomes. Liver transplantation to replace the diseased liver with a cadaveric liver or a living donor graft has historically low survival rates (20%-36%). During 1996–2001 the rate had improved to 61.1%, likely related to adoption of the Milan criteria at US transplantation centers. Expanded Shanghai criteria in China resulted in overall survival and disease-free survival rates similar to the Milan criteria. Studies from the late 2000 obtained higher survival rates ranging from 67% to 91%. If the liver tumor has metastasized, the immuno-suppressant post-transplant drugs decrease the chance of survival. Considering this objective risk in conjunction with the potentially high rate of survival, some recent studies conclude that: "LTx can be a curative approach for patients with advanced HCC without extrahepatic metastasis". For those reasons, and others, it is considered nowadays that patient selection is a major key for success. A receptor tyrosine kinase inhibitor, Sorafenib, approved by the US FDA in December 2005 and in Europe in July 2006, may be used in patients with advanced hepatocellular carcinoma. Sorafenib is a small molecule that inhibits tumor-cell proliferation and tumor angionesis. It has been shown in a Spanish phase III clinical trial to add two months to the lifespan of late stage HCC patients with well preserved liver function. It also increases the rate of apoptosis in other tumor models. The results indicated that single-agent sorafenib might have a beneficial therapeutic effect. In this study, for instance, the median overall survival was of 9.2 months and the median time to progression was of 5.5 months. Also, the survival benefit represented a 31% relative reduction in the risk of death. Surgical resection to remove a tumor together with surrounding liver tissue while preserving enough liver remnant for normal body function. This treatment offers the best prognosis for long-term survival, but only 10-15% of patients are suitable for surgical resection. This is often because of extensive disease or poor liver function. Resection in cirrhotic patients carries high morbidity and mortality. The expected liver remnant should be more than 25% of the total size for a non-cirrhotic liver, while that should be more than 40% of the total size for a cirrhotic liver. The overall recurrence rate after resection is 50-60%. The Singapore Liver Cancer Recurrence (SLICER) score can be used to estimate risk of recurrence after surgery. Transcatheter arterial chemoembolization (TACE) is usually performed for unresectable tumors or as a temporary treatment while waiting for liver transplant. TACE is done by injecting an antineoplastic drug (e.g. cisplatin) mixed with a radioopaque contrast (e.g. Lipiodol) and an embolic agent (e.g. Gelfoam) into the right or left hepatic artery via the groin artery. The goal of the procedure it to restrict the tumor’s vascular supply while supplying a targeted chemotherapeutic agent. TACE has been shown to increase survival and to downstage HCC in patients who exceed the Milan criteria for liver transplant. Patients who undergo the procedure may are followed with CT scans and may need additional TACE procedures if the tumor persists. As of 2005, multiple trials show objective tumor responses and slowed tumor progression but questionable survival benefit compared to supportive care; greatest benefit seen in patients with preserved liver function, absence of vascular invasion, and smallest tumors. TACE is not suitable for big tumors (>8 cm), presence of portal vein thrombus, tumors with portal-systemic shunt and patients with poor liver function. Radiofrequency ablation (RFA) uses high frequency radio-waves to destroy tumor by local heating. The electrodes are inserted into the liver tumor under ultrasound image guidance using percutaneous, laparoscopic or open surgical approach. It is suitable for small tumors (<5 cm). RFA has the best outcomes in patients with a solitary tumor less than 4 mm. Since it is a local treatment and has minimal affect on normal healthy tissue, it can be repeated multiple times. Survival is better for those with smaller tumors. In one study, In one series of 302 patients, the three-year survival rates for lesions >5 cm, 2.1 to 5 cm, and ≤2 cm were 59, 74, and 91 percent, respectively. A large randomised trial comparing surgical resection and RFA for small HCC showed similar 4 years-survival and less morbidities for patients treated with RFA. Selective internal radiation therapy (SIRT) can be used to destroy the tumor from within (thus minimizing exposure to healthy tissue). Similar to TACE, this is a procedure in which an interventional radiologist selectively injects the artery or arteries supplying the tumor with a chemotherapeutic agent. The agent is typically Yttrium-90 (Y-90) incorporated into embolic microspheres that lodge in the tumor vasculature causing ischemia and delivering their radiation dose directly to the lesion. This technique allows for a higher, local dose of radiation to be delivered directly to the tumor while sparing normal healthy tissue. While not curative, patients have increased survival. No studies have been done to compare whether SIRT is superior to TACE in terms of survival outcomes, although retrospective studies suggest similar efficacy. There are currently two products available, SIR-Spheres and TheraSphere. The latter is an FDA approved treatment for primary liver cancer (HCC) which has been shown in clinical trials to increase survival rate of low-risk patients. SIR-Spheres are FDA approved for the treatment of metastatic colorectal cancer but outside the US SIR-Spheres are approved for the treatment of any non-resectable liver cancer including primary liver cancer. Intra-arterial iodine-131–lipiodol administration Efficacy demonstrated in unresectable patients, those with portal vein thrombus. This treatment is also used as adjuvant therapy in resected patients (Lau at et, 1999). It is believed to raise the 3-year survival rate from 46 to 86%. This adjuvant therapy is in phase III clinical trials in Singapore and is available as a standard medical treatment to qualified patients in Hong Kong. Percutaneous ethanol injection (PEI) well tolerated, high RR in small (<3 cm) solitary tumors; as of 2005, no randomized trial comparing resection to percutaneous treatments; recurrence rates similar to those for postresection. However a comparative study found that local therapy can achieve a 5-year survival rate of around 60% for patients with small HCC. Combined PEI and TACE can be used for tumors larger than 4 cm in diameter, although some Italian groups have had success with larger tumours using TACE alone. Portal Vein Embolization (PVE): Using a percutaneous transhepatic approach, an interventional radiologist embolizes the portal vein supplying the side of the liver with the tumor. Compensatory hypertrophy of the surviving lobe can qualify the patient for resection. This procedure can also serve as a bridge to transplant. The most common complication of both TACE and SIRT is post embolization syndrome occurring in 60-80% of patients in TACE and 20-55% in SIRT. Typical findings of post embolization syndrome are fatigue, constitutional symptoms and abdominal pain. It usually lasts 3–4 days with full resolution in 7–10 days. Other more serious complications from TACE and SIRT include liver failure, hepatic dysfunction and gastric ulceration from non-target embolization of the left gastric. Less than 1% of patients who undergo SIRT develop radiation pneumonitis. Complications of RFA are rare but include abscess formation, subcapsular hematoma and tract seeding. While surgical resection offers the best chance at a cure for hepatocellular carcinoma, the tumors are often inoperable due to large size or spread into vascular and adjacent structures. Medical management is generally palliative and aimed at reducing liver disease symptoms. Chemotherapy is traditionally ineffective. Interventional radiology offers minimally invasive treatments that can improve quality of life, increase survival, and reduce symptoms in these patients. High intensity focused ultrasound (HIFU) (not to be confused with normal diagnostic ultrasound) is a new technique which uses much more powerful ultrasound to treat the tumour. Still at a very experimental stage. Most of the work has been done in China. Some early work is being done in Oxford and London in the UK. Hormonal therapy Antiestrogen therapy with tamoxifen studied in several trials, mixed results across studies, but generally considered ineffective Octreotide (somatostatin analogue) showed 13-month MS v 4-month MS in untreated patients in a small randomized study; results not reproduced. Adjuvant chemotherapy: No randomized trials showing benefit of neoadjuvant or adjuvant systemic therapy in HCC; single trial showed decrease in new tumors in patients receiving oral synthetic retinoid for 12 months after resection/ablation; results not reproduced. Clinical trials have varying results. Palliative: Regimens that included doxorubicin, cisplatin, fluorouracil, interferon, epirubicin, or taxol, as single agents or in combination, have not shown any survival benefit (RR, 0%-25%); a few isolated major responses allowed patients to undergo partial hepatectomy; no published results from any randomized trial of systemic chemotherapy. Cryosurgery: Cryosurgery is a new technique that can destroy tumors in a variety of sites (brain, breast, kidney, prostate, liver). Cryosurgery is the destruction of abnormal tissue using sub-zero temperatures. The tumor is not removed and the destroyed cancer is left to be reabsorbed by the body. Initial results in properly selected patients with unresectable liver tumors are equivalent to those of resection. Cryosurgery involves the placement of a stainless steel probe into the center of the tumor. Liquid nitrogen is circulated through the end of this device. The tumor and a half inch margin of normal liver are frozen to -190 °C for 15 minutes, which is lethal to all tissues. The area is thawed for 10 minutes and then re-frozen to -190 °C for another 15 minutes. After the tumor has thawed, the probe is removed, bleeding is controlled, and the procedure is complete. The patient will spend the first post-operative night in the intensive care unit and typically is discharged in 3 – 5 days. Proper selection of patients and attention to detail in performing the cryosurgical procedure are mandatory in order to achieve good results and outcomes. Frequently, cryosurgery is used in conjunction with liver resection as some of the tumors are removed while others are treated with cryosurgery. Patients may also have insertion of a hepatic intra-arterial catheter for post-operative chemotherapy. As with liver resection, the surgeon should have experience with cryosurgical techniques in order to provide the best treatment possible. A systematic review assessed 12 articles involving a total of 318 patients with hepatocellular carcinoma treated with Yttrium-90 radioembolization. Excluding a study of only one patient, post-treatment CT evaluation of the tumor showed a response ranging from 29 to 100% of patients evaluated, with all but two studies showing a response of 71% or greater. The usual outcome is poor, because only 10–20% of hepatocellular carcinomas can be removed completely using surgery. If the cancer cannot be completely removed, the disease is usually deadly within 3 to 6 months. This is partially due to late presentation with large tumours, but also the lack of medical expertise and facilities in the regions with high HCC prevalence. However, survival can vary, and occasionally people will survive much longer than 6 months. The prognosis for metastatic or unresectable hepatocellular carcinoma has recently improved due to the approval of sorafenib (Nexavar®) for advanced hepatocellular carcinoma. Age-standardized death from liver cancer per 100,000 inhabitants in 2004. HCC is one of the most common tumors worldwide. The epidemiology of HCC exhibits two main patterns, one in North America and Western Europe and another in non-Western countries, such as those in sub-Saharan Africa, central and Southeast Asia, and the Amazon basin. Males are affected more than females usually and it is most common between the age of 30 to 50, Hepatocellular carcinoma causes 662,000 deaths worldwide per year about half of them in China. In some parts of the world, such as sub-Saharan Africa and Southeast Asia, HCC is the most common cancer, generally affecting men more than women, and with an age of onset between late teens and 30s. This variability is in part due to the different patterns of hepatitis B and hepatitis C transmission in different populations - infection at or around birth predispose to earlier cancers than if people are infected later. The time between hepatitis B infection and development into HCC can be years, even decades, but from diagnosis of HCC to death the average survival period is only 5.9 months according to one Chinese study during the 1970-80s, or 3 months (median survival time) in Sub-Saharan Africa according to Manson's textbook of tropical diseases. HCC is one of the deadliest cancers in China where chronic hepatitis B is found in 90% of cases. In Japan, chronic hepatitis C is associated with 90% of HCC cases. Food infected with Aspergillus flavus (especially peanuts and corns stored during prolonged wet seasons) which produces aflatoxin poses another risk factor for HCC. Most malignant tumors of the liver discovered in Western patients are metastases (spread) from tumors elsewhere. 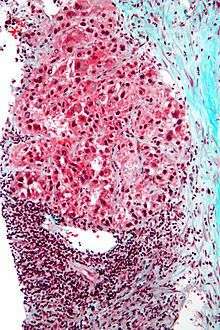 In the West, HCC is generally seen as a rare cancer, normally of those with pre-existing liver disease. It is often detected by ultrasound screening, and so can be discovered by health-care facilities much earlier than in developing regions such as Sub-Saharan Africa. Acute and chronic hepatic porphyrias (acute intermittent porphyria, porphyria cutanea tarda, hereditary coproporphyria, variegate porphyria) and tyrosinemia type I are risk factors for hepatocellular carcinoma. The diagnosis of an acute hepatic porphyria (AIP, HCP, VP) should be sought in patients with hepatocellular carcinoma without typical risk factors of hepatitis B or C, alcoholic liver cirrhosis or hemochromatosis. Both active and latent genetic carriers of acute hepatic porphyrias are at risk for this cancer, although latent genetic carriers have developed the cancer at a later age than those with classic symptoms. Patients with acute hepatic porphyrias should be monitored for hepatocellular carcinoma. Current research includes the search for the genes that are disregulated in HCC, anti-heparanase antibodies, protein markers, non-coding RNAs (such as TUC338) and other predictive biomarkers. As similar research is yielding results in various other malignant diseases, it is hoped that identifying the aberrant genes and the resultant proteins could lead to the identification of pharmacological interventions for HCC. JX-594, an oncolytic virus, has orphan drug designation for this condition and is undergoing clinical trials. Hepcortespenlisimut-L, an oral cancer vaccine also has US FDA orphan drug designation for hepatocellular carcinoma. A randomized trial of people with advanced HCC showed no benefit for the combination of everolimus and pasireotide. HCC, hepatocellular carcinoma; TACE, transarterial embolization/chemoembolization; PFS, progression-free survival; PS, performance status; HBV, hepatitis B virus; PEI, percutaneous ethanol injection; RFA, radiofrequency ablation; RR, response rate; MS, median survival. ↑ Forner, Alejandro; Llovet, Josep M; Bruix, Jordi (2012-03-31). "Hepatocellular carcinoma". The Lancet. 379 (9822): 1245–1255. doi:10.1016/S0140-6736(11)61347-0. ISSN 0140-6736. ↑ Alter, MJ (2007-05-07). "Epidemiology of hepatitis C virus infection.". World journal of gastroenterology : WJG. 13 (17): 2436–41. doi:10.3748/wjg.v13.i17.2436. PMID 17552026. ↑ White DL, Kanwal F, El-Serag HB (December 2012). "Association between nonalcoholic fatty liver disease and risk for hepatocellular cancer, based on systematic review". Clinical Gastroenterology and Hepatology. 10 (12): 1342–59. doi:10.1016/j.cgh.2012.10.001. PMID 23041539. ↑ Cheng, W; S. Govindarajan, A Redeker (February 1992). "Hepatocellular carcinoma in a case of Wilson's disease". Liver International. 12 (1): 42–45. doi:10.1111/j.1600-0676.1992.tb00553.x. PMID 1314321. The patient described here was the oldest and only the third female patient with hepatocellular carcinoma complicating Wilson's disease to be reported in the literature. ↑ Wilkinson, ML; B Portmann, R Williams (1983). "Wilson's disease and hepatocellular carcinoma: possible protective role of copper". Gut. 24 (8): 767–771. doi:10.1136/gut.24.8.767. PMC 1420230 . PMID 6307837. As copper has been shown to protect against chemically induced hepatocellular carcinoma in rats, this may be the reason for the extreme rarity of hepatocellular carcinoma in patients with Wilson's disease and possibly in other liver diseases with hepatic copper overload. ↑ Tanaka, M.; Katayama, F.; Kato, H.; Tanaka, H.; Wang, J.; Qiao, Y. L.; Inoue, M. (2011). "Hepatitis B and C virus infection and hepatocellular carcinoma in China: A review of epidemiology and control measures". Journal of Epidemiology. 21 (6): 401–416. doi:10.2188/jea.JE20100190. PMID 22041528. ↑ Abby, Siegel; Andrew X. Zhu (15 Oct 2009). "Metabolic Syndrome and hepatocellular carcinoma". Cancer (ACS). 115 (24): 5651–5661. doi:10.1002/cncr.24687. PMC 3397779 . PMID 19834957. The majority of 'cryptogenic' HCC in the United States is attributed to nonalcoholic fatty liver disease (NAFLD), a hepatic manifestation of the metabolic syndrome...It is predicted that metabolic syndrome will lead to large increases in the incidence of HCC over the next decades. A better understanding of the relation between these 2 diseases ultimately should lead to improved screening and treatment options for patients with HCC. ↑ "Hepatocellular Carcinoma and Diseases". Retrieved May 12, 2010. ↑ Martin, Nicole M.; Barham K Abu Dayyeh, Ramond T Chung (28 Jul 2008). "Anabolic steroid abuse causing recurrent hepatic adenomas and hemorrhage". World Journal of Gastroenterology. 14 (28): 4573–4575. doi:10.3748/wjg.14.4573. PMC 2731289 . PMID 18680242. This is the first reported case of hepatic adenoma re-growth with recidivistic steroid abuse, complicated by life-threatening hemorrhage. ↑ "Pathophysiology". Retrieved May 12, 2010. ↑ Chien-Jen Chen; Hwai-I. Yang; Jun Su; Chin-Lan Jen; San-Lin You; Sheng-Nan Lu; Guan-Tarn Huang; Uchenna H. Iloeje (2006). "Risk of Hepatocellular Carcinoma Across a Biological Gradient of Serum Hepatitis B Virus DNA Level". JAMA. 295 (1): 65–73. doi:10.1001/jama.295.1.65. PMID 16391218. ↑ "Clinical features and diagnosis of primary hepatocellular carcinoma". UptoDate. Retrieved 4 February 2014. ↑ Ertle, JM; Heider, D; Wichert, M; Keller, B; Kueper, R; Hilgard, P; Gerken, G; Schlaak, JF (2013). "A combination of α-fetoprotein and des-γ-carboxy prothrombin is superior in detection of hepatocellular carcinoma.". Digestion. 87 (2): 121–31. doi:10.1159/000346080. PMID 23406785. ↑ El-Serag HB, Marrero JA, Rudolph L, Reddy KR (May 2008). "Diagnosis and treatment of hepatocellular carcinoma". Gastroenterology. 134 (6): 1752–63. doi:10.1053/j.gastro.2008.02.090. PMID 18471552. 1 2 Duseja, Ajay (2014-08-01). "Staging of Hepatocellular Carcinoma". Journal of Clinical and Experimental Hepatology. Hepatocellular Carcinoma. 4, Supplement 3: S74–S79. doi:10.1016/j.jceh.2014.03.045. PMC 4284240 . PMID 25755615. ↑ "Hepatitis B: Prevention and treatment". Retrieved 28 August 2013. "WHO aims at controlling HBV worldwide to decrease the incidence of HBV-related chronic liver disease, cirrhosis, and hepatocellular carcinoma. by integrating HB vaccination into routine infant (and possibly adolescent) immunization programmes." ↑ "Prevention". Retrieved May 12, 2010. ↑ Kansagara, Devan; Papak, Joel; Pasha, Amirala S.; O'Neil, Maya; Freeman, Michele; Relevo, Rose; Quiñones, Ana; Motu'apuaka, Makalapua; et al. (17 June 2014). "Screening for Hepatocellular Carcinoma in Chronic Liver Disease". Annals of Internal Medicine. 161: 261. doi:10.7326/M14-0558. ↑ Fan, Jia; Yang,Guang-Shun; Fu, Zhi-Ren; Peng, Zhi-Hai; Xia, Qiang; Peng, Chen-Hong; Qian, Jian-Ming; Zhou, Jian; Xu, Yang; et al. (2009). "Liver transplantation outcomes in 1,078 hepatocellular carcinoma patients: a multi-center experience in Shanghai, China" (PDF). Journal of Cancer Research and Clinical Oncology. 135 (10): 1403–1412. doi:10.1007/s00432-009-0584-6. PMID 19381688. ↑ Obed, Aiman; Tsui, Tung-Yu; Schnitzbauer, Andreas A.; Obed, Manal; Schlitt, Hans J.; Becker, Heinz; Lorf, Thomas (2009). "Liver Transplantation for Hepatocellular Carcinoma: Need for a New Patient Selection Strategy: Reply" (PDF). Langenbeck's Archives of Surgery. 393 (2): 147–141. doi:10.1007/s00423-007-0250-x. PMC 1356504 . PMID 18043937. ↑ Cillo, Umberto; Vitale, Alessandro; Bassanello, Marco; Boccagni, Patrizia; Brolese, Alberto; Zanus, Giacomo; Burra, Patrizia; Fagiuoli, Stefano; Farinati, Fabio; Rugge, Massimo; d'Amico, Davide Francesco (February 2004). "Liver transplantation for the treatment of moderately or well-differentiated hepatocellular carcinoma". Ann. Surg. 239 (2): 150–9. doi:10.1097/01.sla.0000109146.72827.76. PMC 1356206 . PMID 14745321. ↑ Josep M. Llovet; Sergio Ricci; Vincenzo Mazzaferro; Philip Hilgard; Edward Gane; Jean-Frédéric Blanc; Andre Cosme de Oliveira; Armando Santoro; Jean-Luc Raoul; Alejandro Forner; Myron Schwartz; Camillo Porta; Stefan Zeuzem; Luigi Bolondi; et al. (2008). "Sorafenib in Advanced Hepatocellular Carcinoma". N Engl J Med. 359 (4): 378–390. doi:10.1056/NEJMoa0708857. PMID 18650514. ↑ "Sorafenib in Advanced Hepatocellular Carcinoma". Retrieved May 12, 2010. ↑ "The Singapore Liver Cancer Recurrence (SLICER) Score for Relapse Prediction in Patients with Surgically Resected Hepatocellular Carcinoma". ↑ "Interventional Radiology Treatments for Liver Cancer". Society of Interventional Radiology. Retrieved 4 February 2014. ↑ Chen, Min-Shan; Li, Jin-Qing; Zheng, Yun; Guo, Rong-Ping; Liang, Hui-Hong; Zhang, Ya-Qi; Lin, Xiao-Jun; Lau, Wan Y (2006). "A Prospective Randomized Trial Comparing Percutaneous Local Ablative Therapy and Partial Hepatectomy for Small Hepatocellular Carcinoma". Annals of Surgery. 243 (3): 321–8. doi:10.1097/01.sla.0000201480.65519.b8. PMC 1448947 . PMID 16495695. ↑ Yamamoto, Junji; Okada, Shuichi; Shimada, Kazuaki; Okusaka, Takushi; Yamasaki, Susumu; Ueno, Hideki; Kosuge, Tomoo (2001). "Treatment strategy for small hepatocellular carcinoma: Comparison of long-term results after percutaneous ethanol injection therapy and surgical resection". Hepatology. 34 (4): 707–713. doi:10.1053/jhep.2001.27950. PMID 11584366. ↑ "onsurgical therapies for localized hepatocellular carcinoma: Transarterial embolization, radiotherapy, and radioembolization". UptoDate. Retrieved 4 February 2014. ↑ Vente MA, Wondergem M, van der Tweel I, et al. (April 2009). "Yttrium-90 microsphere radioembolization for the treatment of liver malignancies: a structured meta-analysis". Eur Radiol. 19 (4): 951–9. doi:10.1007/s00330-008-1211-7. PMID 18989675. ↑ "WHO Disease and injury country estimates". World Health Organization. 2009. Retrieved November 11, 2009. ↑ "Cancer". World Health Organization. February 2006. Retrieved 2007-05-24. ↑ Yang, Jian-min; Wang, Hui-ju; Du, Ling; Han, Xiao-mei; Ye, Zai-yuan; Fang, Yong; Tao, Hou-quan; Zhao, Zhong-sheng; Zhou, Yong-lie (2009-01-25). "Screening and identification of novel B cell epitopes in human heparanase and their anti-invasion property for hepatocellular carcinoma". Cancer Immunology, Immunotherapy. 58 (9): 1387–1396. doi:10.1007/s00262-008-0651-x. ISSN 0340-7004. ↑ Lau W, Leung T, Ho S, Chan M, Machin D, Lau J, Chan A, Yeo W, Mok T, Yu S, Leung N, Johnson P (1999). "Adjuvant intra-arterial iodine-131-labelled lipiodol for resectable hepatocellular carcinoma: a prospective randomised trial". Lancet. 353 (9155): 797–801. doi:10.1016/S0140-6736(98)06475-7. PMID 10459961. ↑ Thomas M, Zhu A (2005). "Hepatocellular carcinoma: the need for progress". J Clin Oncol. 23 (13): 2892–9. doi:10.1200/JCO.2005.03.196. PMID 15860847. ↑ ennerex Granted FDA Orphan Drug Designation for Pexa-Vec in Hepatocellular Carcinoma (HCC) Archived March 25, 2014, at the Wayback Machine. ↑ Sanoff, Hanna K.; Kim, Richard; Ivanova, Anastasia; Alistar, Angela; McRee, Autumn J.; O’Neil, Bert H. (2015). "Everolimus and pasireotide for advanced and metastatic hepatocellular carcinoma". Investigational New Drugs. 33 (2): 505–509. doi:10.1007/s10637-015-0209-7. ISSN 0167-6997. "Long-term results of liver transplantation for hepatocellular carcinoma: an update of the University of Padova experience". September 23, 2013. Retrieved 6 February 2014. Bruix, Jordi; Sherman, Morris; Practice Guidelines Committee (November 2005). "Management of hepatocellular carcinoma". Hepatology. 42 (5): 1208–1236. doi:10.1002/hep.20933. PMID 16250051.